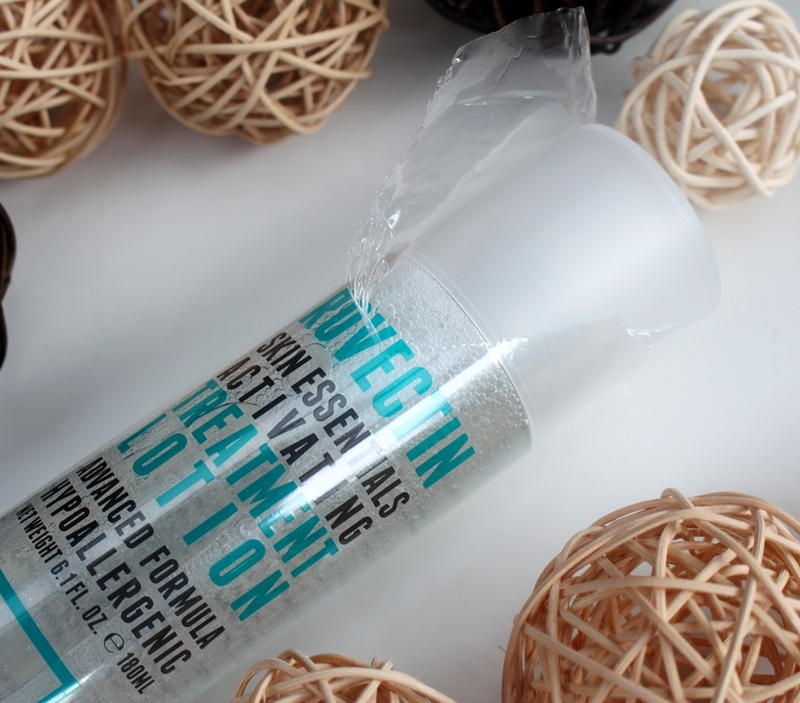 The Rovectin Skin Essentials Activating Treatment Lotion claims to be a pure, gentle formula that enhances the look and feel of your skin with both immediate results and lasting benefits. This is achieved with Rovectin’s Barrier Repair Complex™ which fortifies the skin’s protective layer and prevents moisture loss. 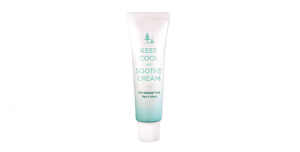 The lotion is said to also gently exfoliate with natural enzymes plus tone the skin and reduce puffiness with caffeine. As you may anticipate, dominating the formulation of this lotion are hydrating agents. 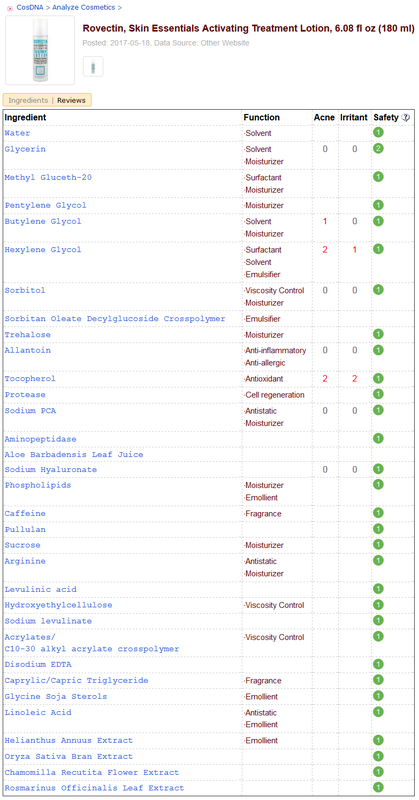 Glycerin and Methyl Gluceth-20 are included at the highest concentrations. Both are humectant that draw moisture from the atmosphere into the skin to keep it healthy by reducing dryness. They complement Caprylic/Capric Triglyceride which has an emollient effect by helping to return skin smoothness and softness. Another softening agent is Linoleic Acid which provides anti-inflammatory, moisturizing and healing support as well as assisting in the fight against acne. Also displaying humectant behaviour with an ability to attract and retain moisture is Pentylene Glycol. A synthetic ingredient, it has antimicrobial effects so also assists to preserve the product. Other humectants include Butylene Glycol, Sorbitol and Sodium PCA. Next in concentration come the moisturising ingredients. Trehalose exhibits rehydrating and water binding properties, as well as antioxidant powers. Allantoin increases water content of the skin while also encouraging natural exfoliation of the stratum corneum and promotion of new cells. As well as being an effective moisturiser, Tocopherol (Vitamin E) is a powerful antioxidant, protecting the skin from free radical damage. Sunflower Extract is another source of Vitamin E, adding strong support to this function. Similarly Aloe Vera Leaf Juice both moisturises the skin as well as soothes it with anti-inflammatory properties. Sucrose is a natural sugar which helps to attract and retain moisture. It contains natural glycolic acid that exfoliates, protects and moisturisers the skin as well as support oil balance. The salt form of Hyaluronic Acid is known as Sodium Hyaluronate (HA). It helps to hydrate the skin through an ability to bind to water and fill the spaces between connective skin fibres, achieving a plumping effect. There are a handful of additional noteworthy ingredients in the lotion. Aminopeptidase is an enzyme that helps loosen cell cohesion while stimulating digestion of keratin protein in the skin to provide a natural exfoliation effect that soothes and softens skin. Caffeine may have soothing and antioxidant properties, particularly when exposed to UV light. Once penetrated, it has a constricting effect that can improve the look of redness and puffiness. Finally, a few botanical extracts including those from Rice Bran, Matricaria Flower and Rosemary round the formula by enhancing antioxidant activity and soothing anti-inflammatory effects. However, as they appear at the very end of the ingredient list, their concentrations are probably insignificant and unlikely to have much impact on the lotion. Other ingredients are included for their ability to improve product texture and increase shelf life. 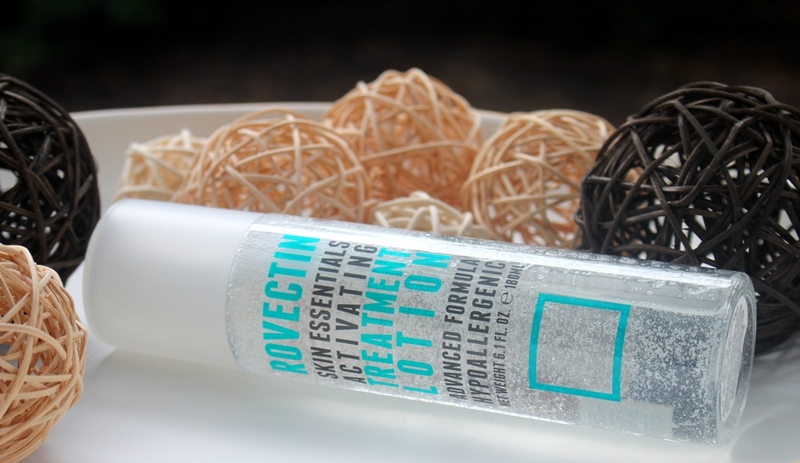 The Rovectin Skin Essentials Activating Treatment Lotion is presented in a tall plastic clear bottle with a controlled opening for dispensing and a protective screw top cap. When brand new, it is wrapped in cling plastic for added protection as shown below. An ideal assessment is returned from both the CosDNA and EWG databases, rating the lotion an ideal low hazard with absolutely no warning flags. Dispense 3-4 drops of Activating Treatment Lotion onto your palm or a cotton pad. Gently pat into your skin to absorb. 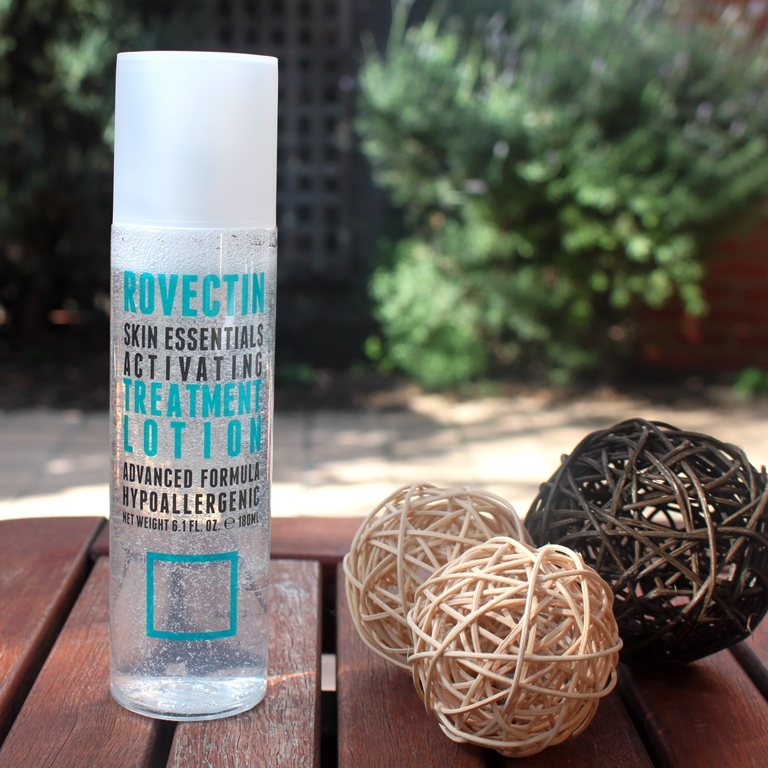 This Rovectin Skin Essentials Activating Treatment Lotion has a very mild slightly medicinal scent. 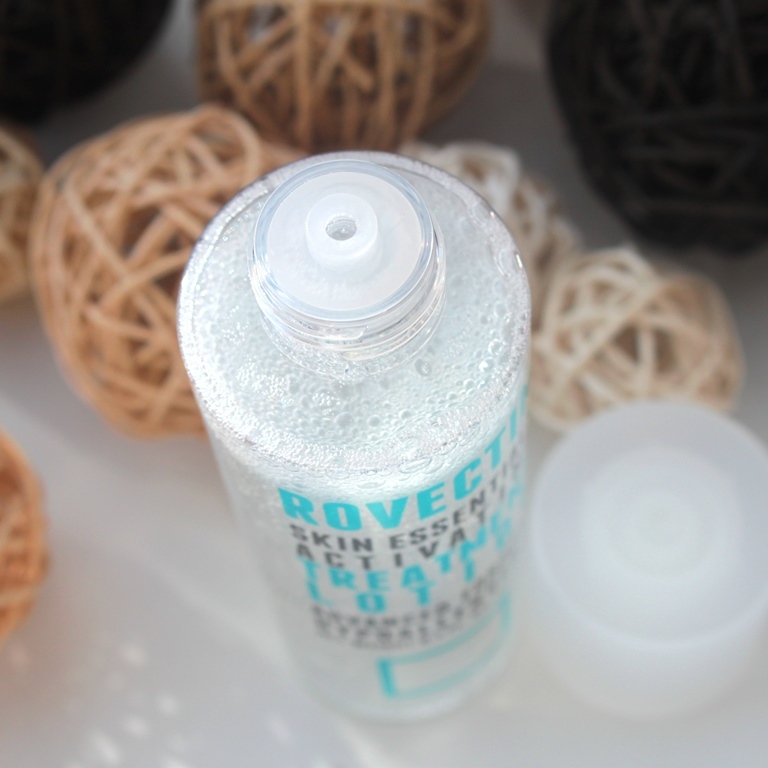 A 180ml bottle of the Rovectin Skin Essentials Activating Treatment Lotion sells for approximately US$31 at Style Korean. 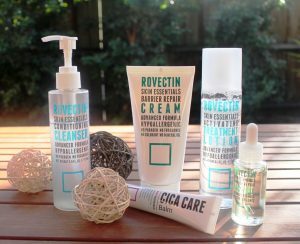 Rovectin products are available at Korean skincare boutiques including iHerb. I received mine from Syle Korean. The cleanser expires 12 months after opening. Mine has a shelf life over two years into the future, date stamped November 2020. 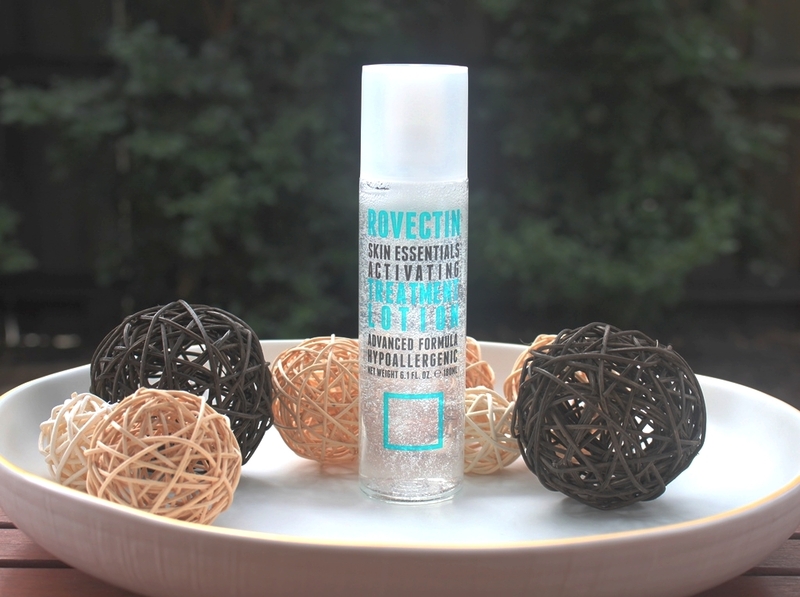 The Rovectin Skin Essentials Activating Treatment Lotion comes in an easy to manage bottle that is clear, indicating it is not light sensitive and allowing the remaining volume to be easily detected. It is a thick liquid with gel like consistency so dispensing is well controlled. It doesn’t escape from the opening like a more watery product might. As it hydrates, I like to pat it into my skin rather than use a cotton round. Preference aside, the latter also results in product waste since part of the lotion is always absorbed into the application pad and discarded. I apply it after serum and before moisturiser although many like to use this as a toner, straight after cleansing. When I perform a light routine perhaps after midday exercise where I don’t reapply actives, then I would absolutely do this. However, I find it quite thick and prefer to use it at emulsion step. It absorbs nicely into the skin although it does leave a slightly tacky residue. This dissipates in the next few minutes, however, I don’t mind as the moisturiser overrides this feeling when layered over the top. Now to the results. This lotion is simply lovely! My face felt smoother and softer immediately after just one use and just one layer. Clearly the large number of humectants and moisturising ingredients in this formula perform. I was so impressed that I halted use of all other hydrating and softening agents in my routine in order to confirm my observations. This included my current hydrating serum, propolis essence and hydrating toner. 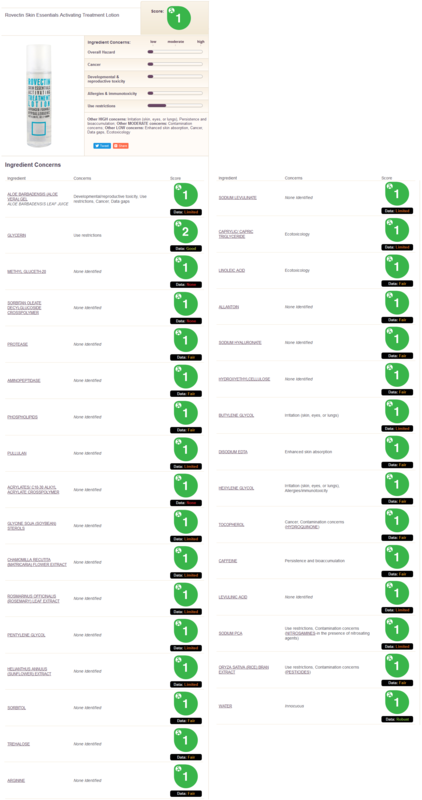 Results were still quite impressive. In fact, even when using this in a two step routine, cleanser followed by a couple of layers of this lotion (no toner, no serum, no oil, no moisturiser), I found it sufficiently hydrating and even satisfying. I haven’t used a two-step routine in a very long time, especially not one that gave me good results. Granted, I only did this for testing purposes and don’t apply it this way in practice but this product certainly enhances my multi-step routine. I have combination skin and found this really lovely, not at all heavy or overwhelming. Together with the great results of the ingredient analysis, both the CosDNA and EWG resources clearing this product of any issues, problems or sensitizers, it’s a winner for all skin types, even sensitive. Returning to the full list of product claims, there is no doubt that this lotion strengthens the skin’s ability to draw and retain moisture. The effects are evident immediately after using it and last until the next application. Given the level of smoothness felt on the skin surface, the enzyme exfoliation also appears successful. The only outcome I cannot confirm is that of reduced puffiness. Apart from a little puffiness under the eyes due to lack of sleep, I don’t really suffer this condition, so it is difficult to conclude that the lotion delivered this benefit. Nonetheless, the other results are reason enough for me to love this product. I was surprised by how much I enjoyed this lotion and the great impact it had on my skin. This is a wonderful product suitable for all skin types. Its gentle formula will please those with sensitive skin while excellent hydration will impress those suffering dryness. My combination skin happily drank it up. This product was provided to me free of charge by Style Korean for review. This post only includes my honest opinion and experience of this product and is in no way influenced by Rovectin, Style Korean, any of its representatives or any other third party.